(Akron, OH) – Aged in freshly emptied barrels from this well-known iconic Canadian whiskey, BORIS takes-on an incredible flavor and aroma that sets it worlds apart from any barrel aging we’ve ever done. It has a very memorable, sophisticated, and extra-smooth whiskey character that brilliantly compliments our rich and flavorful BORIS Imperial Stout. The official release of this legendary Hoppin’ Frog beer begins at the brewery next week on Saturday July 22nd. 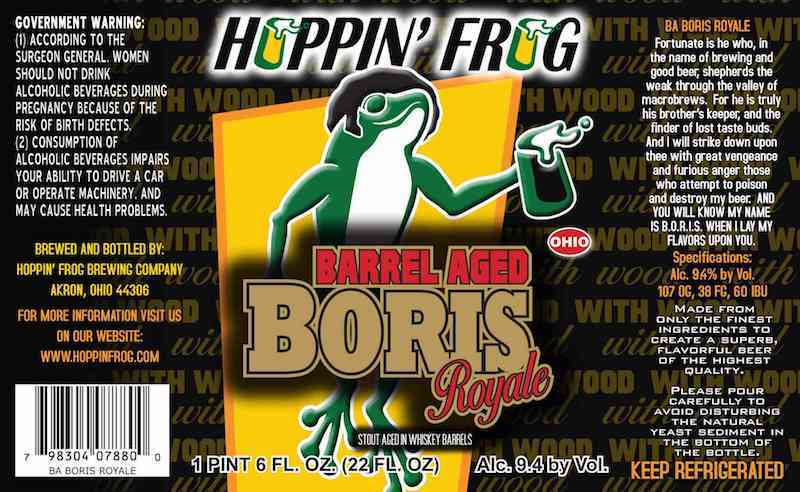 at 11:00 a.m.
I’m personally very excited that we were able to find more of these rare barrels, and we once again are releasing this very sought-after Hoppin’ Frog beer! These barrels were used over and over again at the distillery, so they don’t have much flavor left from the actual wood of the barrel, but instead are super-soaked with this high-quality Canadian whiskey to impart an absolutely wonderful flavor. Back in the day, this was the first barrel aged beer we released that was not aged in Bourbon barrels, and it was really quite a hit because of its great flavor. It will be sold in our big, sharable 22-ounce bottles for $17 each. We’d suggest buying at least 2 bottles, because its perfect to drink now, as well as age for years to come. Also, 10% case discounts are available for mixed or non-mixed cases of 12 bottles. So, don’t miss this very special beer release – we hope to see you here! !